Old Mr. Otway stays up late one night, conversing with his dear friend and neighbour, Philip Bennion, on De Quincey's notion of "Murder Considered as One of the Fine Arts." What is his shock, then, when he awakens to find his friend mysteriously dead! The coroner's inquest ruled Bennion died of natural causes, but Otway is not so sure. If it was murder, the list of suspects is a mile long. There's Raymond Clinton, Bennion's dissolute nephew, who stands to inherit his estate. Then there are Nina Macrae, Bennion's ward, and her fiancé Ralph Hardwicke, whose marriage Bennion opposes. And finally, there is Otway himself. A known somnambulist, could he have killed Bennion in his sleep? 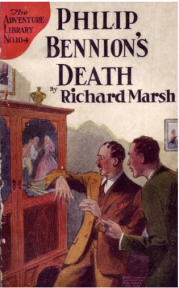 A classic murder mystery with twists and turns to keep readers guessing, Philip Bennion's Death (1897) is one of Richard Marsh's most enjoyable (and rarest) novels. Originally published the same year as his masterpiece The Beetle, Philip Bennion's Death ranks among the prolific Marsh's most thrilling stories.